**I have to preface this post with the fact that it was obviously written a few weeks ago, as I mention that I’m leaving for my weeding in less than a week, and guess what, I already told you yesterday that I just got back from my wedding! Who doesn’t like peanut butter? 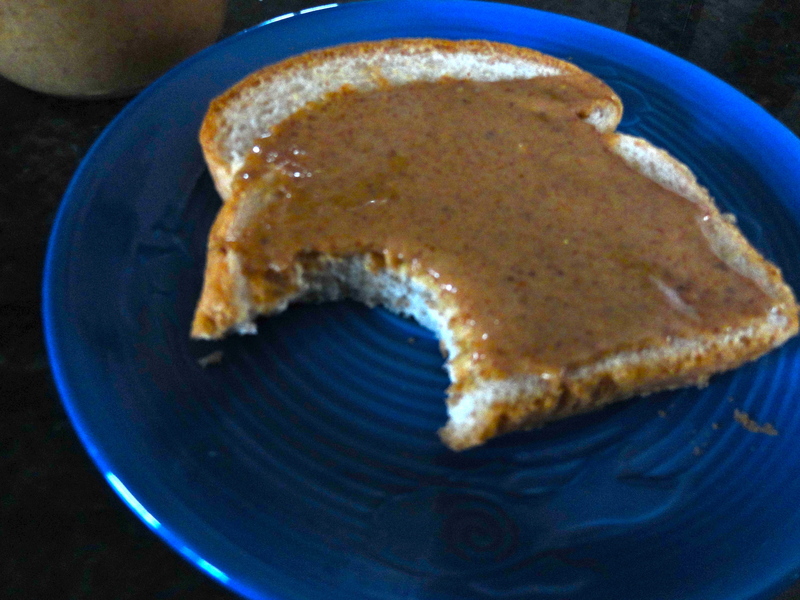 I’m not sure I know anyone personally, but I’m sure there is someone out there 😐 While I really love peanut butter with almost anything, almond butter is just as good. I’ve been saving this recipe for quite some time, for no particular reason, except that I didn’t know when I’d have time to make it. Seeing as though I am not working (oh yeah, big announcement! ), I have found that I have had quite a bit of time on my hands. Funny how easily you can keep yourself busy when you’re not working. You start to wonder how you had time to get anything done before! Great news for me, we are leaving for our wedding in less than a week, and getting things ready has certainly kept me busy over the last few weeks. Finalizing menus, choosing wines, coordinating arrivals, list after list, and I suppose I should start thinking about packing sometime soon. 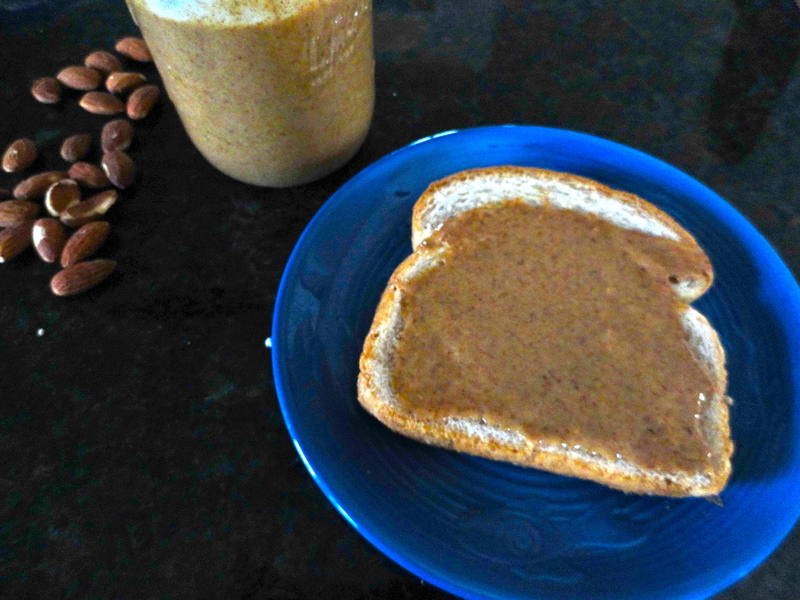 Anyway, back to the almond butter. I was a little skeptical as to if this would turn out well, but I had the perfect opportunity! My girlfriend, Kim (also famous on my blog for her sun-dried tomato guacamole), made a freaking delicious Pad Thai a few weekends ago at my bachelorette party weekend, and I’ve been dying to recreate it. Not only was the Pad Thai out of this world, but it was vegan and gluten-free. Could life get any better? 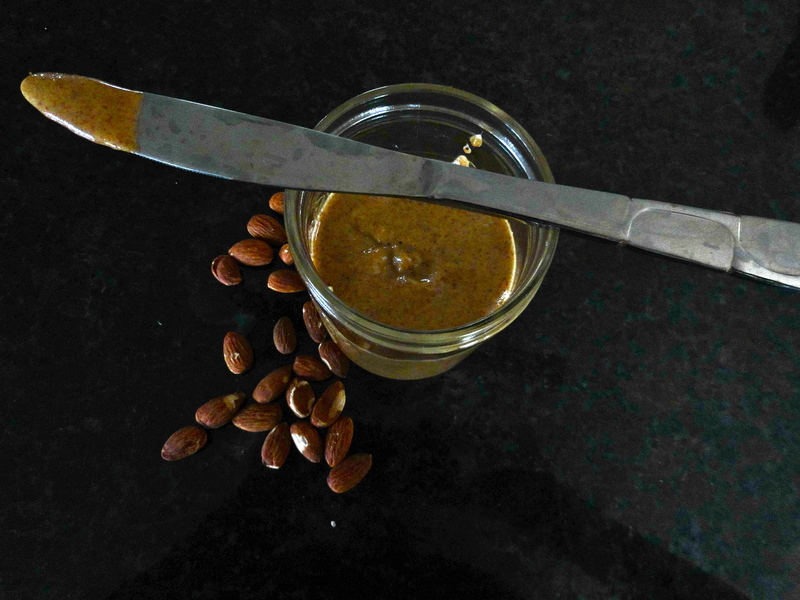 Kim’s sauce was made with almond butter, and so instead of buying some, I figured this was my calling to finally make this almond butter recipe I’d been saving for probably over a year. 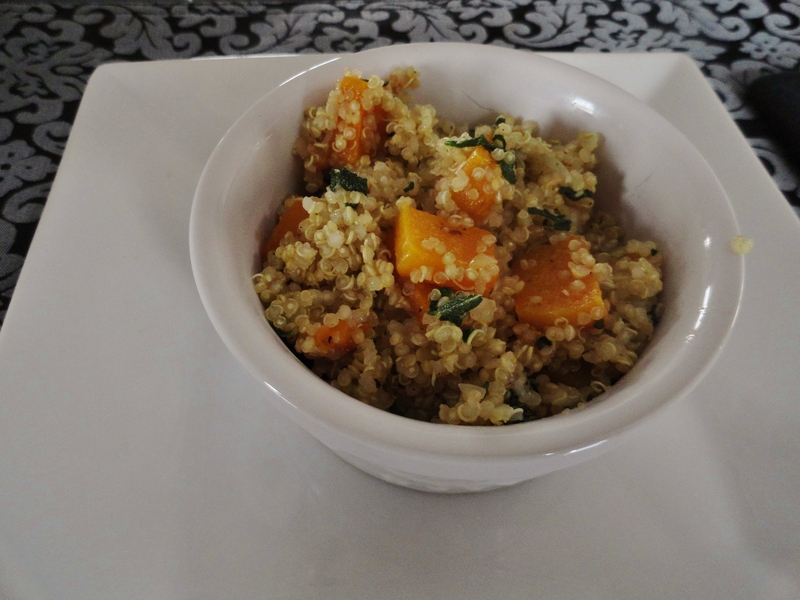 Funny thing is, it couldn’t have been any easier, and I thought it tasted delicious! Make up a batch and enjoy it on toast, sandwiches, cookies, by the spoonful or even in a Pad Thai recipe (I’ll post the vegan recipe soon, promise). You’ll love it! Source: Adapted from Honey, What’s Cooking? 1. 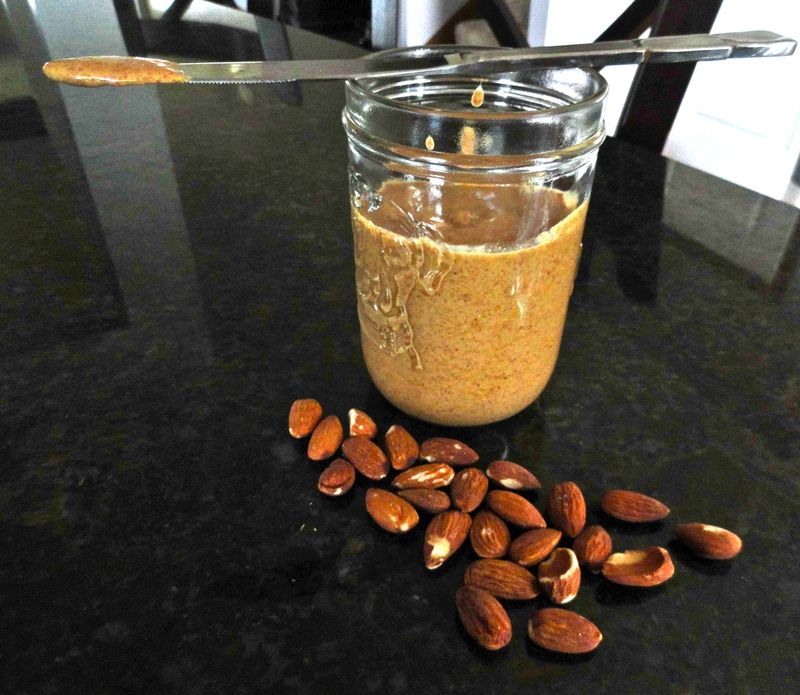 Add almonds into the bowl of a food processor. Process for a few minutes, stopping every so often to scrape down the sides. The mixture will first look like a course flour, but when processed for longer, will eventually form a dough, and finally a creamy butter. This could take anywhere between 7-10 minutes of processing. Just keep an eye on it and continue to stop and scrape down the sides. 2. Once the mixture resembles a creamy butter, add sugar, oil and a pinch of salt to taste. Pulse a few times to combine. Taste and adjust seasonings as desired. Transfer to airtight container and store in refrigerator for up to 2 weeks. The latest installment of recipe swap was themed seafood, which I was over-the-moon excited about. Again, this swap was hosted by Sarah, at A Taste of Home Cooking. 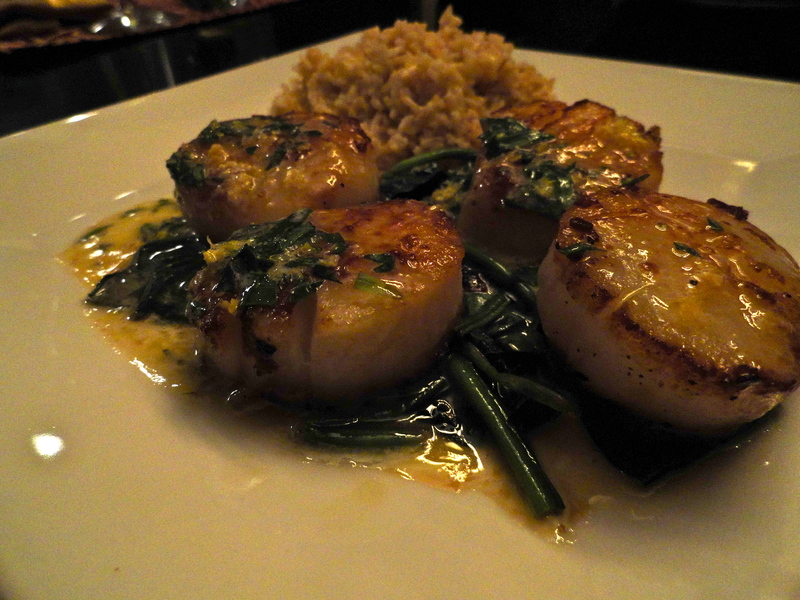 I submitted Scallops with Tarragon Butter Sauce, and couldn’t wait to receive my assigned recipe. Honestly, I was slightly disappointed to find that I was assigned crab cakes. But not because I don’t like crab cakes, rather because I already have two crab cake recipes in my blog (Bethany Frankel’s Crab Cakes and Crab Cakes with Chiptole Mayo), and I really enjoyed both of them. 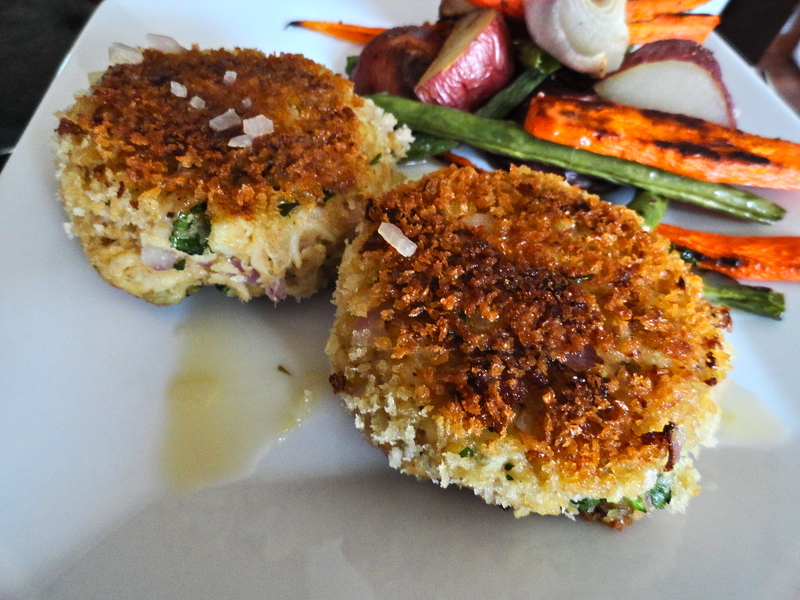 But, that’s the spirit of the recipe swap; you never know what you’re going to get (you know, like a box of chocolates), and really, how could I be disappointed to make crab cakes – I love them! 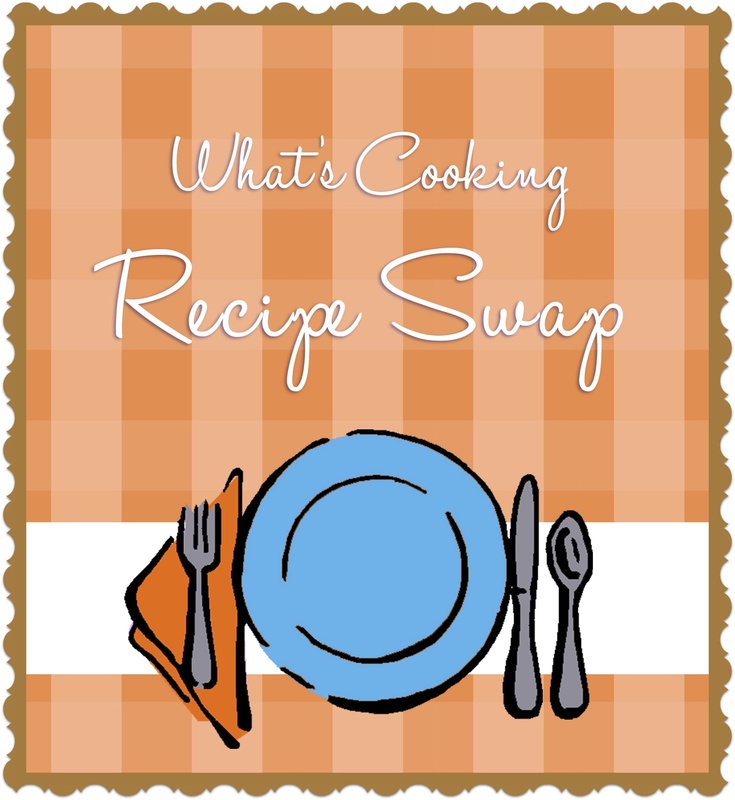 Another great benefit of the recipe swaps is to connect with other bloggers, and many times, blogs you might not have otherwise visited. I’ve definitely visited The Redhead Baker blog before, and may have even bookmarked a handful of Coleen’s recipes, but I believe this would be the first time I’d be making one. And what a great recipe to make! 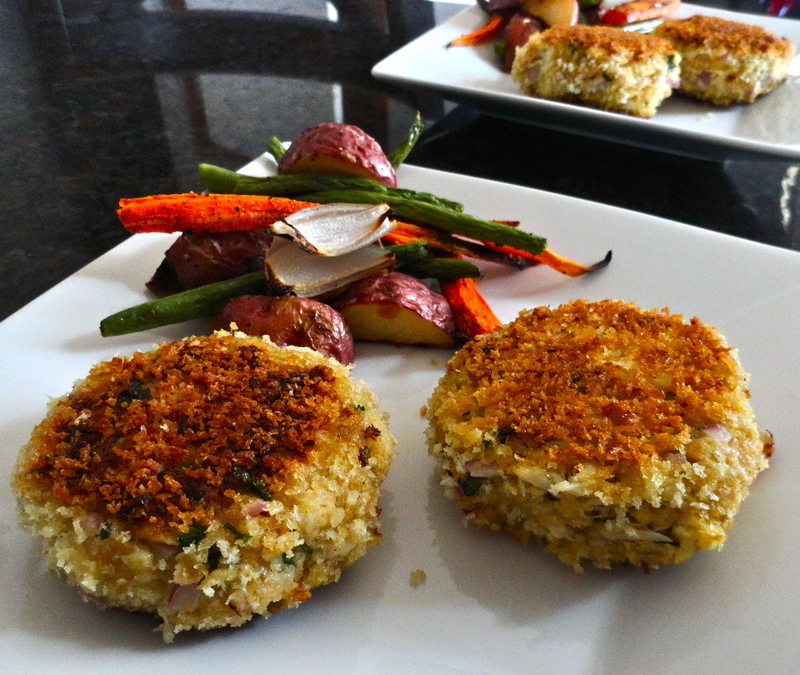 The recipe originally comes from Cooking Light, and it certainly is a lightened up version of crab cakes, which I love. Less filler, more crab, exactly the way they should be. 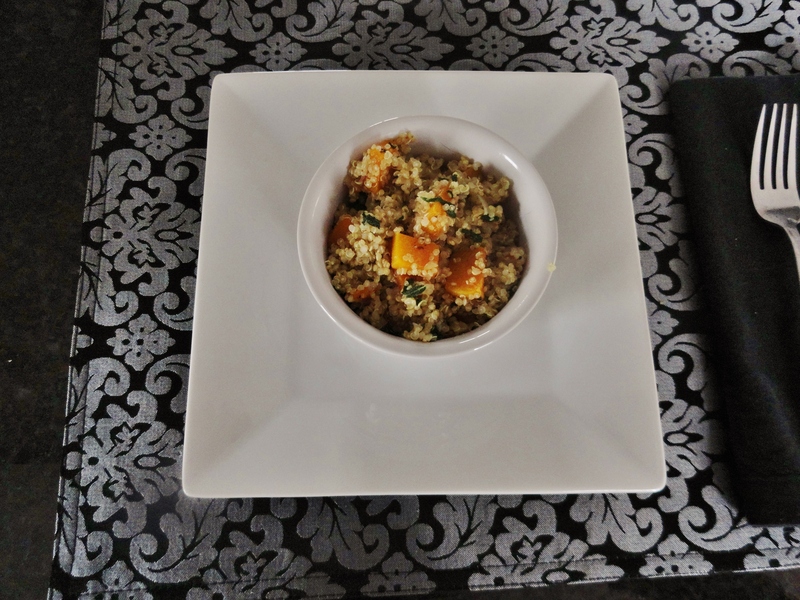 I had gotten everything I needed for this recipe last week at the grocery store, and I generally am very good at knowing exactly what, and how much I have of everything in my kitchen. I was absolutely convinced that I had Old Bay seasoning, but come Sunday when I was putting these together, I didn’t. I Googled a recipe to make my own Old Bay (what would we do without Google? ), and had most spices on hand, so just used what I had. Coleen’s recipe included a tangy butter sauce to go with the crab cakes, which I thought sounded interesting. If you read either of my other crab cake recipe posts, you’d know that I am generally a creamy-sauce-with-my-crab-cakes kinda girl. But, I’m always happy to try something new! I’m not sure if this is the sauce pictured in Coleen’s picture, as her’s does look like a creamy mayo based sauce. Either that, or mine turned out completely different. But good different! The tangy butter sauce was a great compliment to the crab cakes and the vegetables. While I was reducing the sauce, the vinegar smell was strong, so I was concerned it would be too acidic, but once I added the butter, it was much more subtle. The crab cakes were perfect! Meaty without a lot of filler, firm enough to stay together, but still fork-flakey like you’d want. Breading the outside in panko added a perfect amount of crunch. The vegetables were an added bonus. It was perfect that they roasted for the same amount of time it takes for the crab cake mixture to refrigerate and come together. Coleen’s recipe didn’t include green beans, but the original did, and I thought the plate needed some color, so I added those to the mix. However, I didn’t think they would need to roast for 30 minutes, so I added them into the vegetable mix after 15 minutes. Turns out, that’s exactly what the Cooking Light recipe instructed. Great instincts! 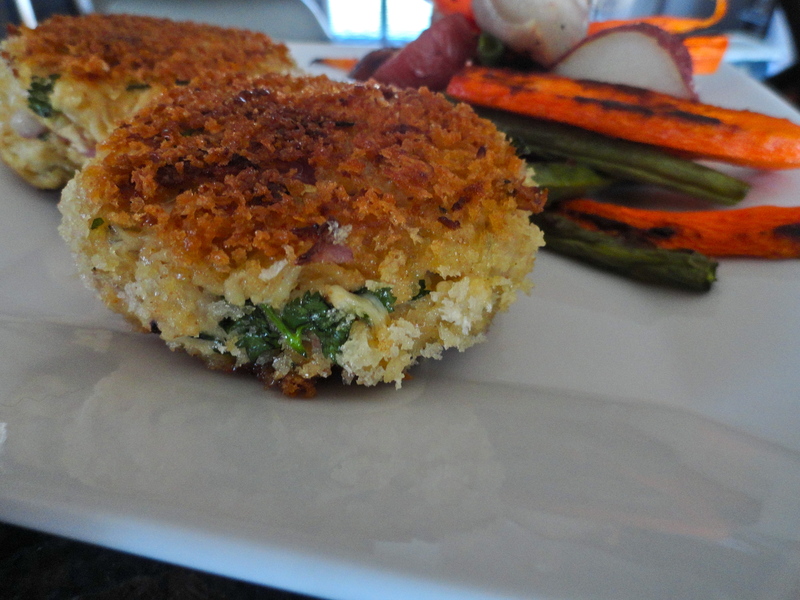 Overall, it was a great little meal and I was happy to have tried a new crab cake recipe! 1. In a medium bowl.combine red onion, cilantro, mayonnaise, Dijon, Old Bay, Worcestershire and egg whites. Gently fold in crab meat until combined. Stir in 3/4 cup panko. Cover with plastic wrap and refrigerate for 30 minutes. 2. Meanwhile, preheat oven to 450 degrees and prepare a baking sheet with foil. Combine carrots, shallots, and red potatoes in a bowl and coat lightly with olive oil. 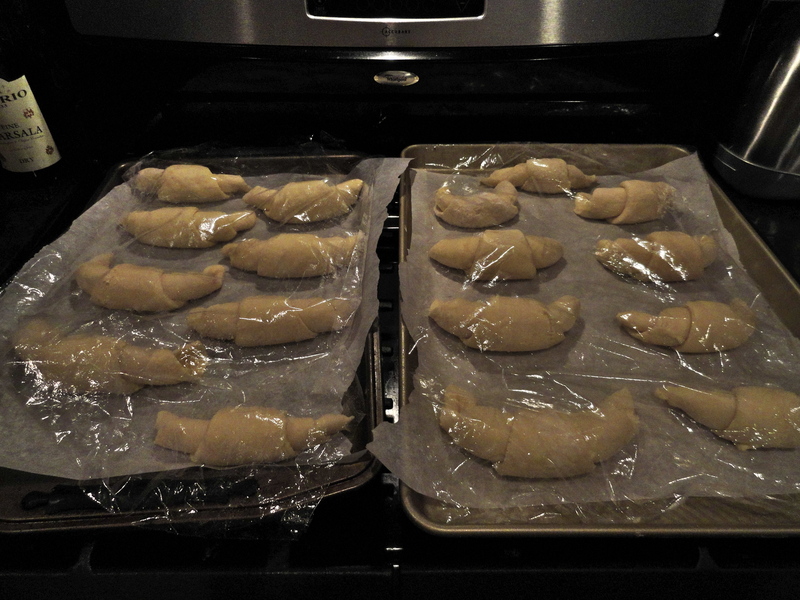 Dump onto prepared baking sheet and spread out into a single layer. Sprinkle with salt and pepper. Roast for 15 minutes. Remove from oven and mix green beans in with the rest of the vegetables. Return to oven and roast for another 15 minutes. 3. Put remaining panko breadcrumbs in a shallow dish. 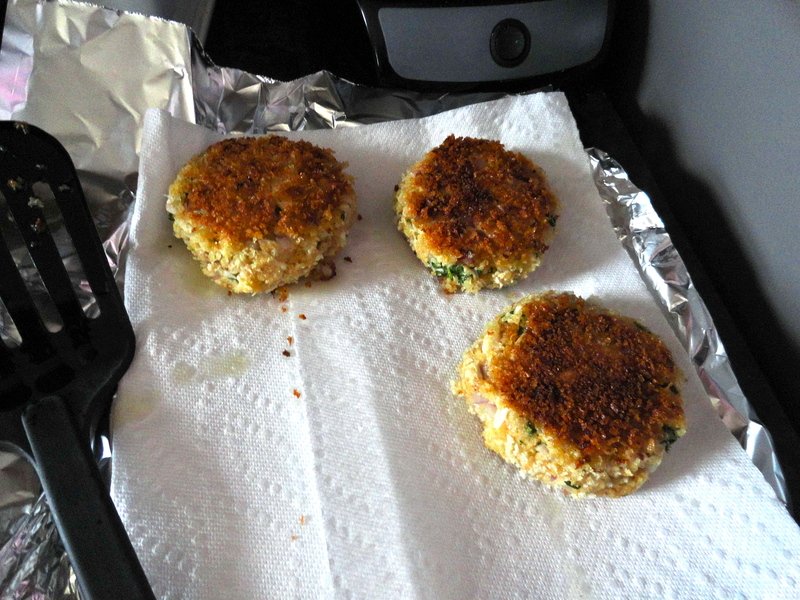 Remove crab mixture from refrigerator and divide into eight equal portions, forming each into a tight patty. Dredge each patty in the panko, evenly coating both sides. 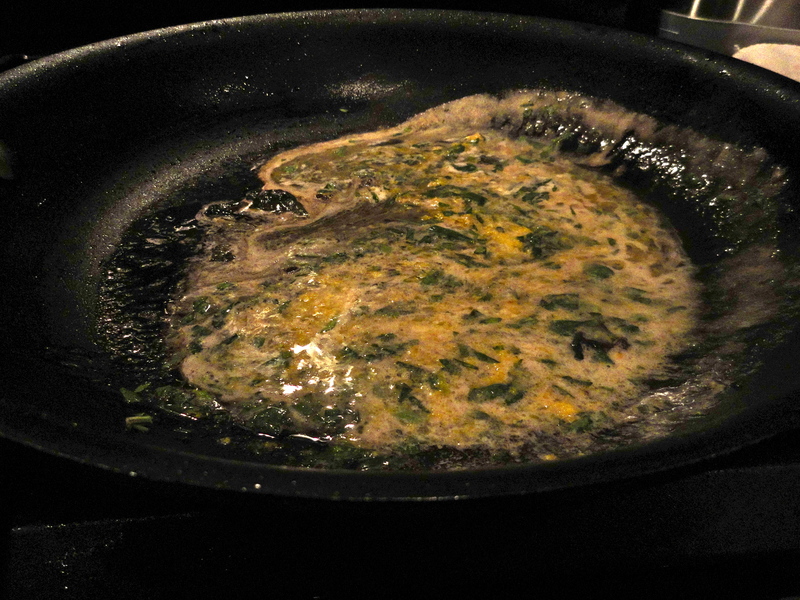 In a large frying pan, add enough olive oil to coat the bottom and heat to medium. Once oil is ready, gently place four patties in the pan and cook until browned on the bottom, about 5 minutes. Carefully flip patties and cook until browned, another 5 minutes or so. Transfer to a paper towel and repeat for remaining four patties. 4. In a saucepan, stir together chicken broth, vinegar and shallots. Bring to a boil and continue boiling for 5-8 minutes, until reduced by half. Remove from heat and swirl in butter. Spoon sauce over crab cakes and vegetables and serve. Take a look at what the other ladies cooked up for the seafood swap! Nate loves scallops. 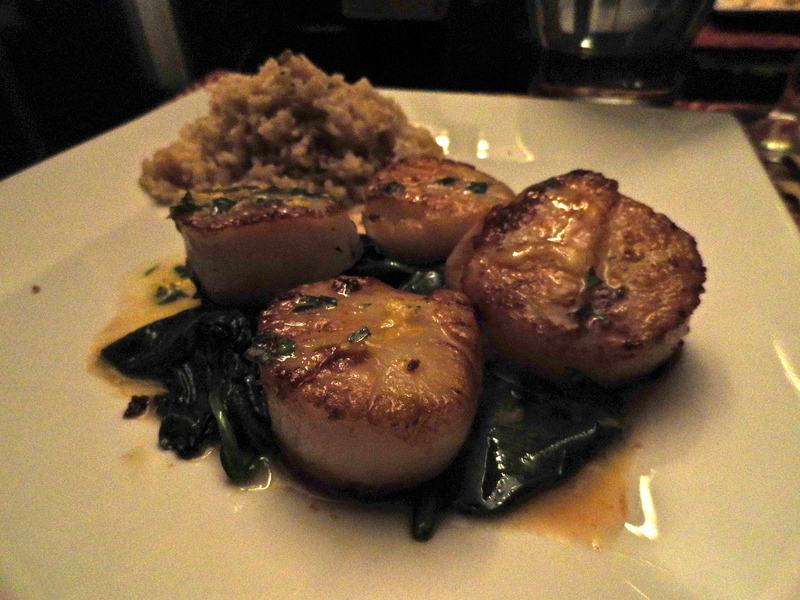 Whenever we go out to eat, and there are scallops on the menu, there is a 95% chance that is what he’s ordering. I find it adorable that he sometimes confuses scallops with scallions. Easy mistake when reading it on a menu – not like he looks at green onions and thinks they are scallops. If that were the case, I might be worried. Anyway, today is his birthday, so I wanted to make something special for him. I was really hoping I didn’t screw anything up, because wouldn’t that be a crappy birthday present? Even if I did, I would hope he would have been satisfied with his birthday weekend. 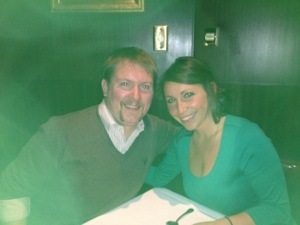 We had a fabulous dinner at the Capital Grille in Minneapolis on Friday night. I am not kidding you – this was the best steak I have ever had. They were cooked absolutely perfectly, and the rubs they use are to die for! For dessert, he got the creme brulee and I ordered the flourless chocolate cake. My goodness, it was so delicious! On top of that, we had superb service. It’s too bad we waited for so long to try this place, but it was well worth the price tag! If you’ve never been, I highly recommend it. Another reason he should be satisfied for his birthday (even if I did screw up the scallops), is that I got him a smoker. He’s been talking about this since we moved in. Nate doesn’t do a lot of cooking, though he does most of the grilling. Not that he’s incapable, but he just doesn’t do it. For this reason, I’ve put off indulging his fascination with a smoker. But, I found one that was a smoker and roaster, which my brother said was highly recommended by his customers, so I went with that one. Plus, bonus, it was in my budget. 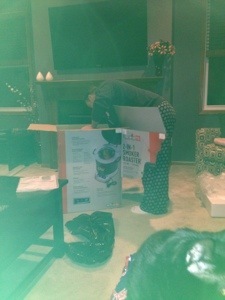 He was like a little kid on Christmas morning opening it up. In case you are wondering why my pictures have a green tinge…it’s because I have a green case on my phone, and when I use my flash, it reflects off the side – I just realized this last night. Duh. Nate said they just melted in his mouth. The tarragon butter sauce was the perfect complement. I thought the tarragon might be a little to overpowering for the delicate scallops, but they actually complimented each other perfectly. 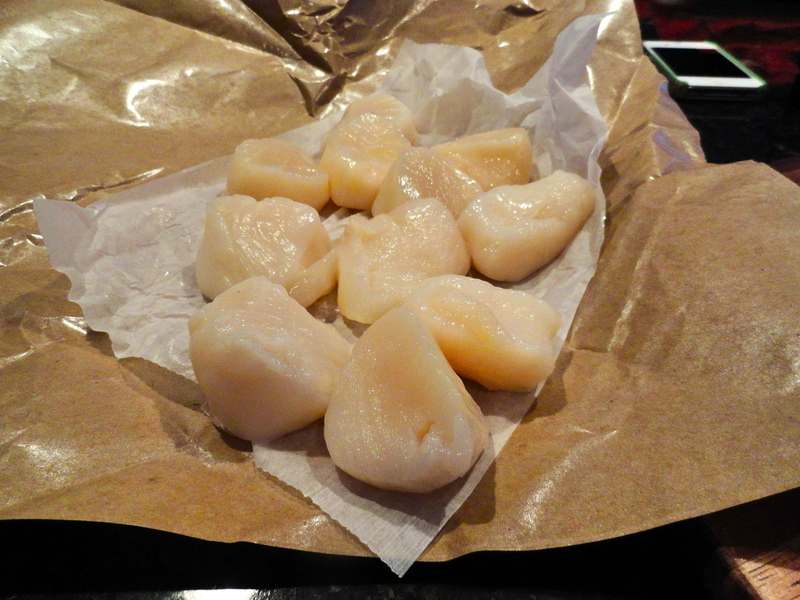 I now will not be so terrified to make scallops again – though I doubt I’ll make them often seeing as though they were $22/lb 😮 Another bonus, one more thing checked off my 30 before 30 list! 1. In a large non-stick frying pan, heat 1 tbsp of oil with 1/2 tbsp of butter over moderate heat. Season scallops with 1/2 tsp salt and pepper. Put half the scallops in the pan. Cook until browned, about 2 minutes. Turn and cook until browned on second side and just cooked through, about 1 to 2 minutes more. 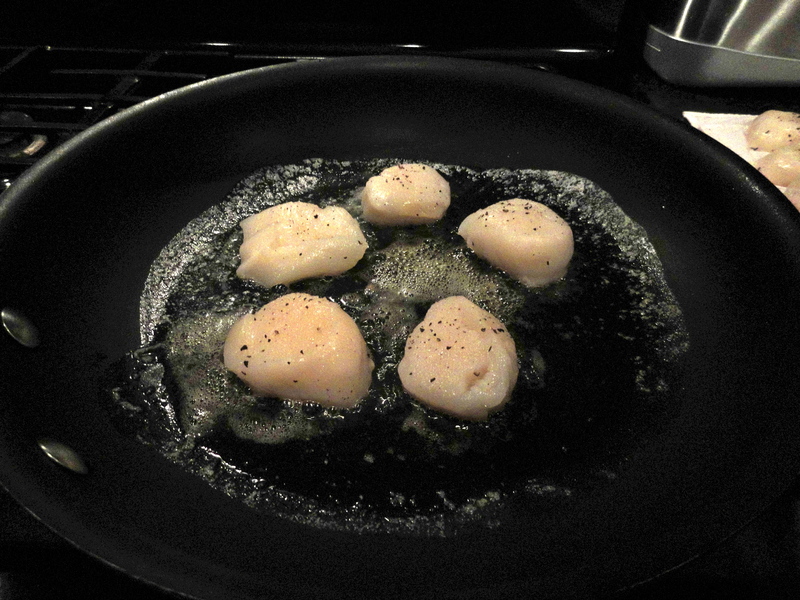 Heat remaining 1 tbsp oil with 1/2 tbsp butter in pan and cook remaining scallops. Remove and place on paper towel. 2. Reduce heat to low, and add spinach to pan. Turn several times to coat in pan juices. Add lemon juice, and quickly remove from pan as soon as leaves have wilted. 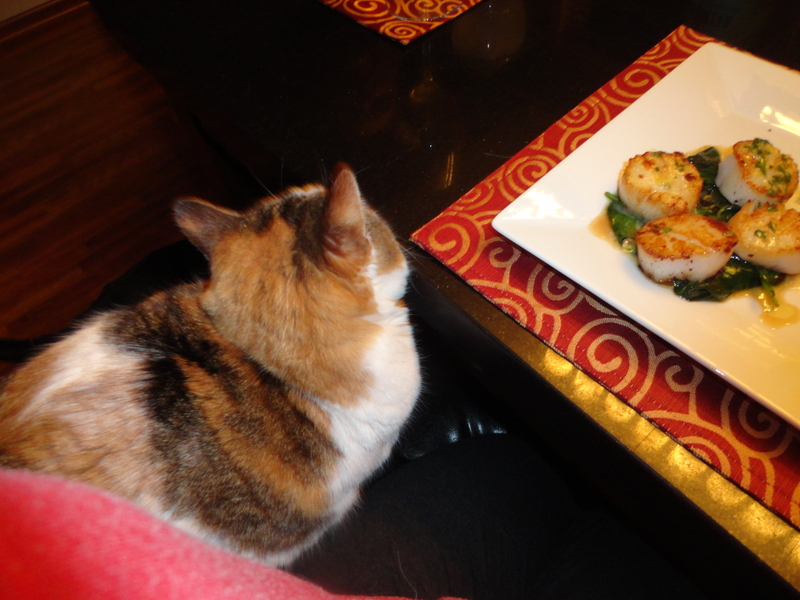 Divide spinach on plates and place scallops on top of spinach. 3. Wipe out pan. Return pan to moderate-low heat and add wine. Boil until reduced to about 2 tbsp, 1 to 2 minutes. Reduce the heat to lowest setting. Whisk the remaining 4 tbsp butter into the wine. 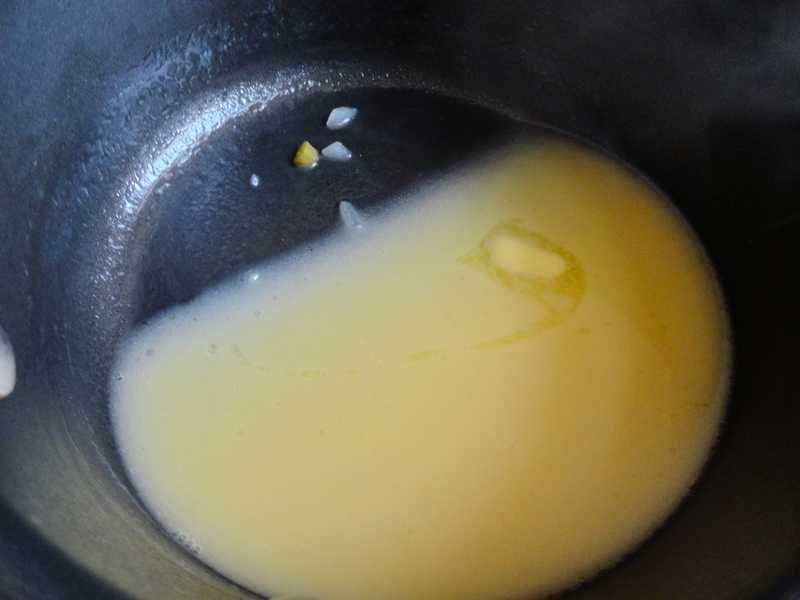 The butter should not melt completely, but just soften to form a smooth sauce. 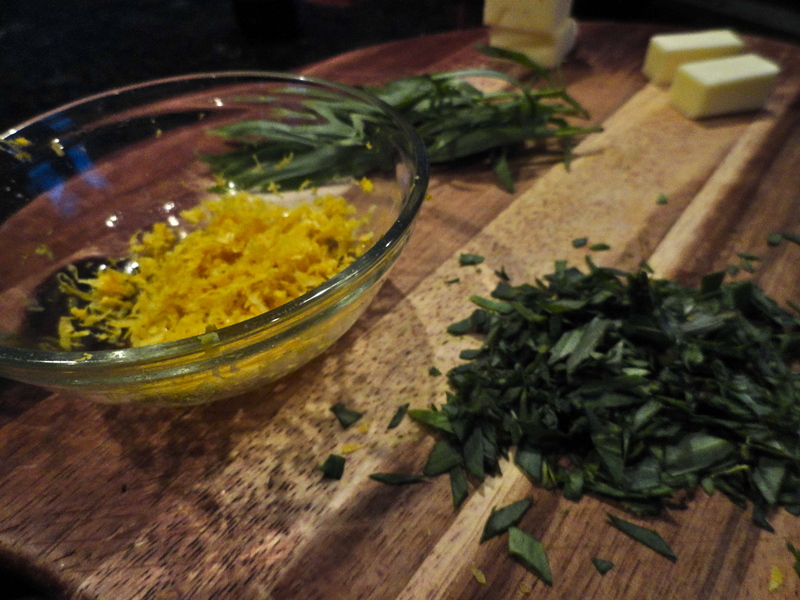 Add remaining 1/2 salt, lemon zest and tarragon. Pour over scallops and serve. The best picture of course is the one where Charlotte thinks this is her plate. Perfect. 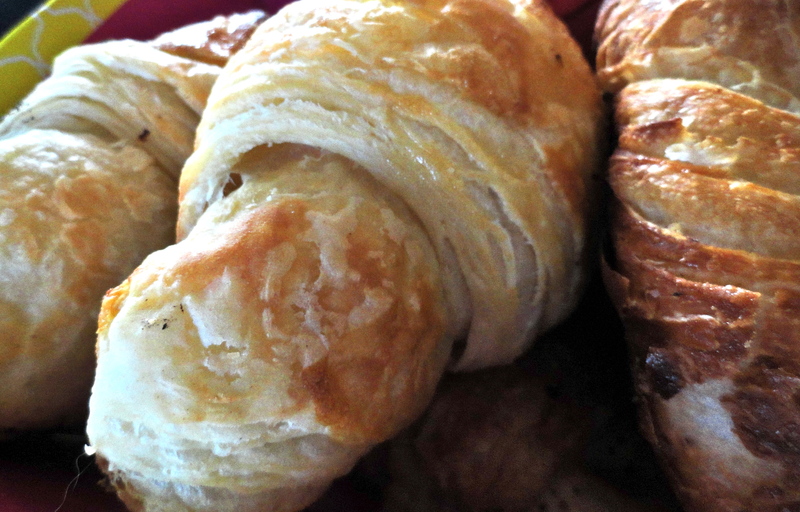 Flaky. Buttery. A Pie Dough for the Holidays. Pies scare me. I’ve successfully made a few pie crusts in the past, and I really didn’t have any major issues, but they still terrify me. I really enjoyed the pie crust I used for my French silk and fresh strawberry pie, but I came across this recipe in, you guessed it, Food and Wine, and decided I must try it! I mean, “Perfectly Flaky Yogurt-Butter Pie Dough”? Tell me how many words you don’t like in that title? None? Okay, me too. 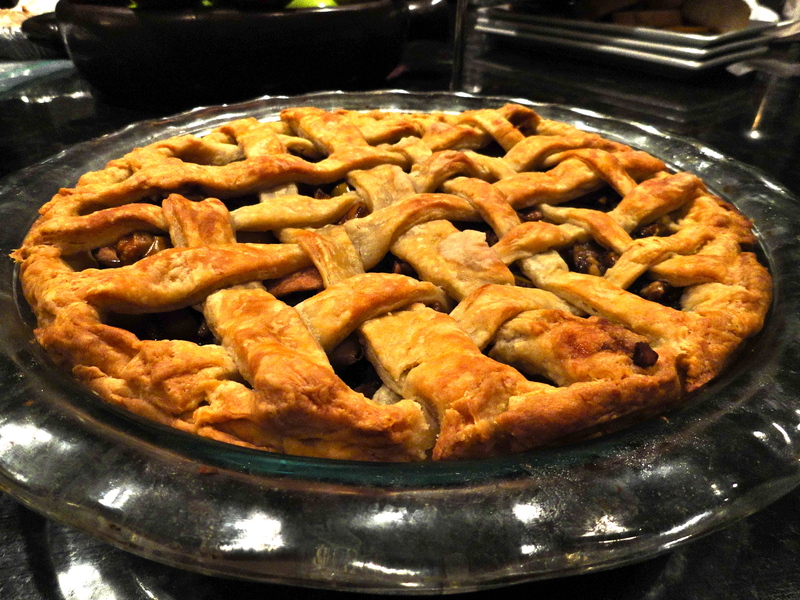 I used this crust for my bourbon apple pie, and it really lives up to its name. Perfect. Flaky. Buttery. While I could taste the tang of the yogurt (which was delicious), it wasn’t one of the three words flashing in my head. Perfect. Flaky. Buttery. 1. It doesn’t tell you how long or at what temperature to bake it. I guessed. I guessed right! 2. While the article said that the dough should just barely hold together, it wasn’t even workable after refrigerating it overnight. I had to add more yogurt to be able to roll it out into a crust. 3. This isn’t a terrible problem, but it was DELICIOUS! 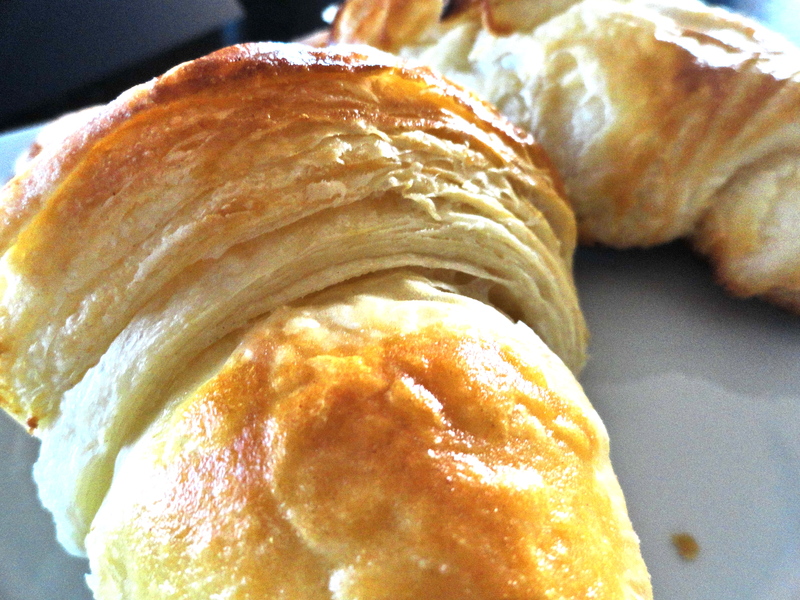 The result truly was perfectly flaky and buttery. Not only was I proud of myself for nailing a crust – that seemed disastrous at first, but I also checked one more thing off my 30 Before 30 list, and made a lattice top. BAM! I haven’t perfected it yet, so I’m not quite ready to tell you how to do it (I’m still not sure how I did it!). Soon enough. Anyway, back to the crust. Perfect. Flaky. Buttery. The key is to keep all the ingredients cold while you are preparing the dough. PERFECT. FLAKY. BUTTERY. 1. Measure flour into a glass or ceramic bowl and freeze for 15 minutes. Freeze the 3 tbsp-size chunk of butter for 15 minutes. Place 5 tbsp of diced butter on a plate and refrigerate for 15 minutes. In a glass bowl, combine yogurt with salt and 1 tbsp cold water and refrigerate for 15 minutes. 2. In the bowl of a food processor, add flour and 5 tbsp of diced butter. Pulse until mixture resembles fine oat flakes. Using a sharp knife or cheese plane, very thinly slice remaining 3 tbsp of butter and freeze slices for 5 minutes. 3. Add butter slices to bowl. Toss gently to separate slices. Slices should remain cold and intact. Drizzle the cold yogurt into the bowl, using a rubber spatula to toss as you drizzle. Continue tossing and scraping down the sides of bowl until crumbly and evenly moistened. Press dough into 6-inch disk and wrap tightly in plastic wrap. 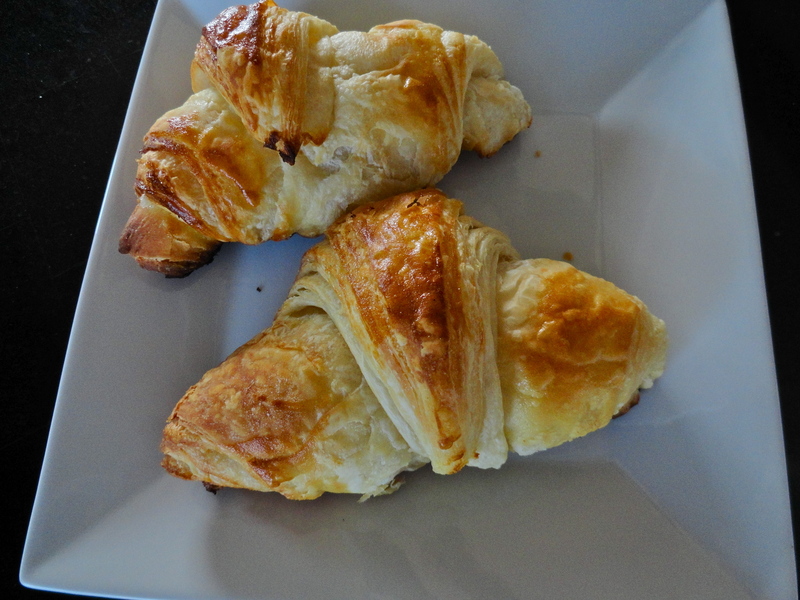 Refrigerate dough for at least 2 hours or overnight, freeze for up to 1 month. 4. 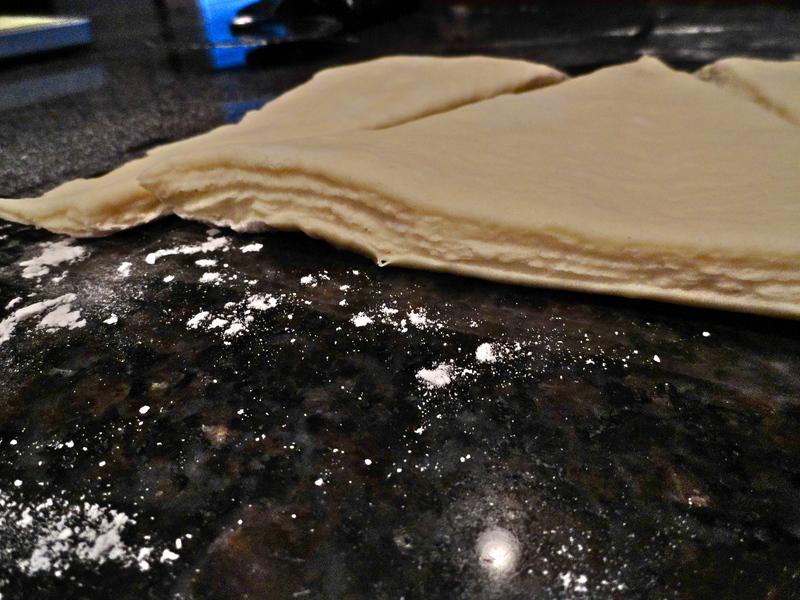 Using a lightly floured surface, roll out dough into a 13-inch round. Carefully transfer dough into pie plate. Cut overhang and roll edges under. Flute crust as desired. Fill pie with desired filling. Bake at 375 for 45-60 minutes.